READ ME FIRST Before you write the next chapter in the story of you. Get your copy today for just $24.95, and begin to transform your life, forever! Have you ever heard someone say, “If only life came with a set of instructions”? Success coach, Lisa Stephenson has – hundreds of times. Almost every client utters this at some point in some form. Read Me First is the book she now gives them. It is also the book she wishes someone had given her when she found herself suddenly single with three young children and needing a new plan. “Life is awesome, then it’s hard, then it’s awesome again”, says Lisa. When you get to a difficult stage – in your personal or professional life – then this book is essential reading before you set out to write the next chapter in the story of YOU. Read Me First will challenge your thinking then provide a structured way to reflect and take action. You’ll find quotes for inspiration and questions to ask yourself. Most importantly this is about doing the work on you – do that, and you will grow, you will change, and you will succeed. When you change, so does the world around you. 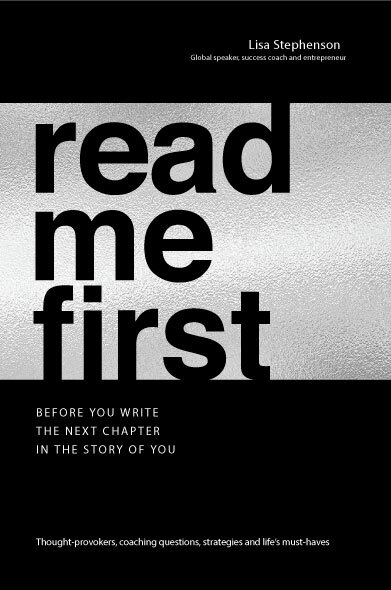 Read Me First by Lisa Stephenson. Copyright 2018 Lisa Stephenson Consulting Pty Ltd.